The POS Software is often referred to as the point of service because it is not just a POS Software but also a point of customer order. 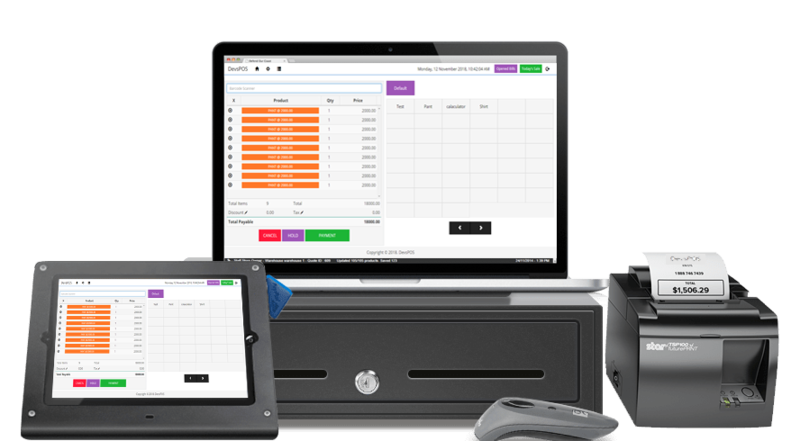 Additionally, today POS Software may include additional features to cater for different functionality, such as inventory management. Admin can enter products will stock. Stock will works with sales and it will manage autoatically. If admin wants to know about the stock on his shop then he can check the stock status in this system. Admin can create sales person. sales person can slae sproducts through POS Screen. Admin can track the sales points. Admin will have full report of his sales. Admin can manage employee or workers through DevsPOS. Admin can also pay salaries through this system. Admin can manage sales transaction and also can manage expense and incomes. Admin can find how much he get profite and how much lose. DevsPOS will take care of whole accounts section. You just need to check. Admin can track person wise sale, profit-loss, income-expense, product stock etc.